Getting an excellent credit score for yourself or your business can feel frustrating when you're just starting. First, you discover that you need to have a history of using credit responsibly to earn a good score. You wish to build that history with loans or credit cards but may get denied because you don't have a history. The same thing can happen if you had financial troubles that damaged your credit, and now you're ready to start rebuilding. It can feel like everyone wants someone with great credit, but nobody is willing to give you a chance to be great. Starter loans can break this cycle and get you on the path to excellent credit. Lenders design starter loans for businesses and individuals who have no credit history and want to earn high credit scores. A starter loan can have many different structural components. The different terms can all affect how likely you are to get approved, how much interest you pay and the benefit to your credit score. However, they all have the same goal: to prove your creditworthiness through consistent payments. Many of these products work the same way whether you borrow for your business or yourself. A secured loan is a lesser-known financial tool that can help borrowers of all kinds. These loans work much like savings accounts, but they report to credit scoring agencies. If you want to save money for a big purchase and build credit while you're at it, this is an excellent option. First, you apply for the loan with specifications about how much you need and how long you want to make payments. Be realistic about how long it will take to pay off your loans, considering your monthly budget and overarching goal. Your lender will then tell you how much to pay each month. Unlike most lines of credit, you will not get your funds right away. Instead, you make consistent monthly payments based on your agreement with your lender. As you make payments, the lender reports your shrinking balance and payment schedule to the credit agencies. When the term is over, you have paid the loan off, and you will get your funds. Your credit score will soon reflect the fact that you took out a loan, made payments on time and paid your debt. While you may feel tempted to pay the whole amount off early, remember that the monthly payments make all the difference on your score. Since the loan funds secure the loan itself, there's little risk for the lender, which gives you a higher chance of approval. The less you borrow, the better chance you have, and you don't have to borrow much. You can get a starter loan of just $500 and pay it off over a year. A starter loan can also be a standard secured loan. With this option, you pay for the loan amount up front instead of through monthly payments. The lender puts those funds in a frozen savings account and collects the interest on it. This method also reports to credit agencies and is low risk for lenders. If you need cash for a personal or business expense right now, you can find unsecured credit builders. In many cases, you can get the funds the same day you get approved. Some of these loans have more stringent requirements for approval. However, there are a few options for those who need to build or repair their credit scores. World Finance is one popular lender that provides such funds. While the exact World Finance loan requirements vary based on many factors, the company caters to people with little to no credit. Applicants do not even need bank accounts. You can also take advantage of the World Finance tax service to get a refund advance loan. The company secures these loans based on your estimated tax refund. Instead of waiting for the government to mail a check, you walk out of the office with your money and pay the company back when you get your refund check. While there are several excellent starter loan options, there is one that you should approach with caution: payday loans. These lenders promise to give you cash today and allow you to pay after your payday, hence the name. People often borrow a few hundred dollars with the intention of closing the account in just a few weeks. The low credit requirements and quick access to cash can make these loans seem attractive. However, these lenders charge incredibly high interest rates. Payday loans from brick-and-mortar lenders cost an average of $15 for every $100 you borrow, which translates to a 391 percent APR for a two-week loan. Online payday loans typically cost $23.53 for every $100 borrowed. Depending on the term of the loan, that could translate to a whopping 613 percent APR. If you can't repay a payday loan on time, you get a finance fee. Most borrowers end up spending over $500 just on financing fees for the same loan. Of course, these fees lead to a vicious cycle of not being able to repay, which hurts your credit score. While most adults know that they need to tend to their credit scores to achieve financial success, fewer people understand business credit. Just like agencies assign you a rating based on your borrowing history, they do this with your business. When you first start a business, it's like a brand-new baby with no credit history. As such, vendors may want you to pay upfront for everything instead of opening a line of credit. Furthermore, having separate business and personal credit can protect your personal assets. If you buy business items on personal credit and cannot pay the debt, the lender may come after your private money and belongings rather than that of your business. Business loans and credits cards can help you avoid this fate. However, getting such products when you have no credit history with your business is difficult. Many of these loans will carry high interest rates, at least until you bring the company's credit score up. Like with personal scores, starter loans can help you start building your business credit score or can help repair it after a difficult time. These loans come in all the same varieties as the personal loans. What Is the Best Starter Credit Card for a Business? If your company has no credit history, shows a less than great credit score or hasn't been in business long, you may have trouble getting some business credit cards. However, some cards allow you to show your personal credit score as proof of your creditworthiness. Opening the right card and using it responsibly can help you increase your company's score. Over time, you can gain access to cards with better benefits, such as great mileage points or cash-back systems. 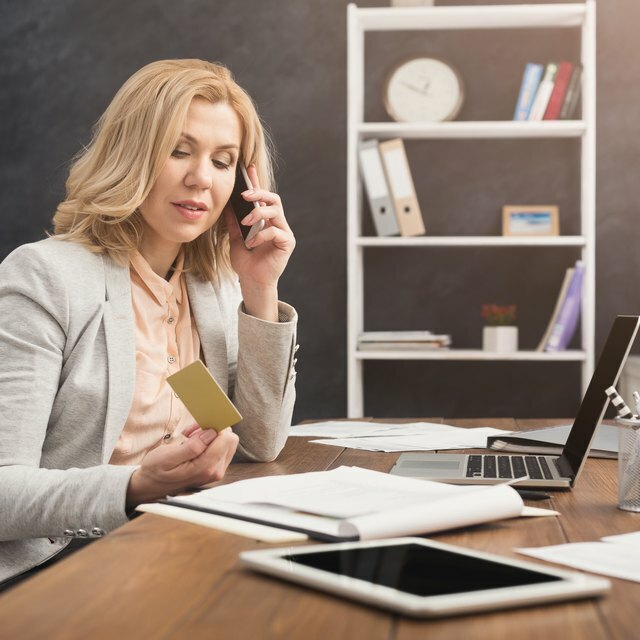 While there's no single business credit card that is perfect for every company, you can look for a few key factors to pick the right one for you. First, make sure that your personal credit score is high enough to qualify. Do not pick an option simply because it has the best offers. Applying for a card and getting rejected can hurt your score. For example, the Chase Ink Business Preferred℠ credit card offers tens of thousands of bonus points when you sign up, three points per dollar on travel and one point per dollar on everything else. If you fly a lot for business, this may seem perfect. However, Chase generally only accepts applicants with credit scores of at least 690. If your personal score is right at that line or lower, it may not be worth the risk of rejection. On the other hand, the Spark® Classic from Capital One® accepts applicants with personal scores of 630 to 689. Next, consider the annual fees. Many cards charge you a fee each year just to keep the account open. However, some waive that fee for the first year, and others do away with it altogether. Choose a card with an annual fee that you feel comfortable paying for several years. Continuing with the same credit card for a long time helps your credit score. Finally, you should always think about APR, or interest rates, before you choose a business credit card. Some cards, like the American Express Blue Business℠ Plus, give you zero percent APR for 15 months. This offer is perfect if you know you will need to carry a balance for that long. Other cards may not have such offers but will charge lower rates after the introductory period. Of course, if you pay off your balance before the end of each billing cycle, the APR will not take effect. If you have to go into debt to get your business running or out of a rough patch, these loans can help. However, paying off the debt and seeing the results in your business credit report can take a lot of time. Luckily, you can take several other steps to protect your assets and improve your credit score. First, be sure to incorporate as an LLC and obtain an employer identification number. Then, you can open a bank account in your company's name. Finally, be sure that the credit reporting agencies know about your business. You can open a file at Experian, Equifax and TransUnion. Although these agencies have to give you access to your personal credit report once per year, they do not have to give this access to your business. Dun & Bradstreet issue identifications for businesses called "D-U-N-S" numbers. If you apply for one of these, many bureaus can use it to make credit decisions about your company. You can complete all of these steps in one to two months if you want to build credit quickly. To continue the momentum, take out a six-month secured loan for your business and make timely payments. You can also ask vendors if they report payments to the credit reporting bureaus. If so, you can apply for a line of credit with each vendor and pay off new balances within a month or two. You may see the effects of these transactions soon after the vendor reports your payments. However, you should carefully monitor your business credit score if you take this route. Vendors could forget or even report incorrect information. If this happens, it will reflect in your credit report, and you can dispute it with the bureau. If it's your personal credit score that's holding you back, first look through your full report from each bureau. One in four consumers has at least one error on his credit reports. If there are any inaccuracies whatsoever, dispute the claim with the agency. You should start by filing a letter with the bureau. You can also reach out to the organization that gave the information to the bureau. It may take about 35 days for the bureau to finish investigating your claim. If that time passes and you haven't heard anything, follow up. NerdWallet: What Is a Payday Loan?